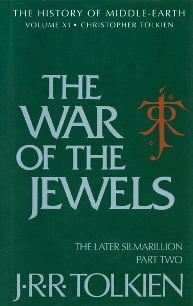 The War of the Jewels is volume eleven in the twelve-volume History of Middle Earth by JRR Tolkien. This volume, and the previous volume, Morgoth’s Ring, are a collection of Tolkien’s writings on the “Elder Days” or “Later Silmarillion” of Middle Earth which took place between approximately 1950 and the author’s death in 1973. Tolkien returned to the tales of the Elder Days after his completion of The Lord of the Ringsin 1950, and there followed, during the early 1950’s, a period of high creativity on these tales. Tolkien began a new “Lay of Leithian”, “The Tale of Tuor and his Coming to Gondolin” (published in Unfinished Tales), and many others during this time frame, but few of them were finished. As editor Christopher Tolkien notes in his foreword to Morgoth’s Ring, “a potentially destructive doubt had emerged” during this time-frame (MR pg vii). Tolkien began to feel that his tales of the Elder Days, most written long before The Lord of the Rings, must be rethought and rewritten to become consistent with the published text. This “rethinking” would have entailed a massive amount of rewriting and editing, and no doubt seemed very overwhelming to Tolkien. Ultimately, his progress on these Elder tales stalled, and never again regained the vigor of his pre-Lord of the Rings writings. Morgoth’s Ring and The War of the Jewels address writings from the same general time period, including writings that overlap one another. For organization’s sake, Christopher Tolkien split the tales concerning Aman and the Valar into Morgoth’s Ring and those concerning Middle Earth and the “wars of the Silmarils” into The War of the Jewels. The first (and largest) section of the book pertains to “The Grey Annals”, a year-by-year account of events in Middle Earth from the “Birth of the Elves” to the death of Túrin Turambar. The annals present a very generalized account of events, with the exceptions of the tales of “Beren & Luthien” and “Túrin Turambar”, which are given in fairly high detail. The Later Quenta Silmarillion, picks up the narrative of the Quenta Silmarillion where it was dropped at the end of Morgoth’s Ring. MR took the tale up to the flight of the Noldor and their return to Middle Earth. The War of the Jewels continues with the Quenta Silmarillion with the coming of men and continues through the “Wars of the Jewels” as Tolkien called them…the trials and eventual downfall of the Noldor in their wars against Morgoth. The Later QS is heavily fragmented, and relies on copious editorial commentary to hold it together. Christopher Tolkien does not attempt to reproduce the writing in its entirety, but instead to compare and note any changes or edits to the earlier (pre-LotR) versions of these tales found in the “Quenta Silmarillion” section of volume V of The History of Middle Earth, The Lost Road and Other Writings. This technique may be disorienting, particularly to those who did not read the earlier versions of the tales found in The Lost Road. This is a very significant tale concerning Hurin, the father of Túrin, who is finally released by Morgoth after the deaths of his children. Tolkien thought the tale of Húrin and his children was central to the tales of Middle Earth, and “The Wanderings of Húrin” completes that tragic cycle. Húrin leaves Thangorodrim “in grief, embittered by the lies of the Dark Lord” (WotJ pg 252). Still, the curse on Húrin and his family endures, and all that Húrin touches turns to ill, until he finally contributes, indirectly, to the fall of Doriath, the last bastion of Elvish resistance. The last part of The War of the Jewels is a long essay Tolkien wrote concerning the languages of the elves, and will be of especial interest to those who study Tolkien’s created languages. The essay concerns itself with names and their meanings in the native Elven tongues, including several appendixes providing some clues to the Elvish names for Middle Earth’s other races: Men, Dwarves, and Orcs. The final volume in The History of Middle Earth is The Peoples of Middle Earth, which relates specifically to the Appendices to The Lord of the Ringsand a few other “Late Writings” involving Middle Earth.